The National Transportation Safety Board is launching an investigation into an accident that occurred last week when an American Airlines jet struck a runway distance marker upon takeoff from John F. Kennedy International Airport, the agency announced Wednesday. On April 10 at 8:40 p.m., the Airbus A321 scheduled to fly to Los Angeles with 110 people on board took off from the New York airport and struck the object with its left wingtip, according to the airline and investigators. The wing of the American Airlines jet hit the ground of runway 31L, striking the "5,000-foot" marker that enables pilots to know exactly how much runway is left and damaging a number of runway edge lights as well, two FAA officials told ABC News. Passenger Oran Revivo said "everyone kinda froze up." "And the person next to me grabbed my arm, the person on the other side of me grabbed my arm, and everyone just kind of held on really tight. It was really a terrifying moment for everyone." According to air traffic control audio obtained by ABC News via LiveATC.net, the pilot at the time reported an "uncontrolled bank ... 45 degrees to the left" and later described the plane wing lowering "uncommanded" upon takeoff. About 10 minutes after takeoff, the pilots requested to return to Kennedy to "check things out." The pilot, according to passenger Courtney Snyder, told those on board that there was "computer malfunction." Airbus A330-N276AY belonging to American Airlines. 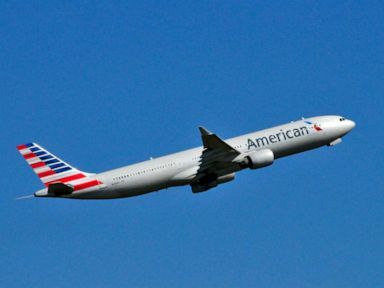 The flight returned to the airport and landed safely with no injuries to passengers or crew, American Airlines said in a statement. NTSB investigations typically last 6-12 months and culminate with the independent agency determining a probable cause of the accident.